First, use your measuring tape to measure the opening of the window that will become your glass block window. 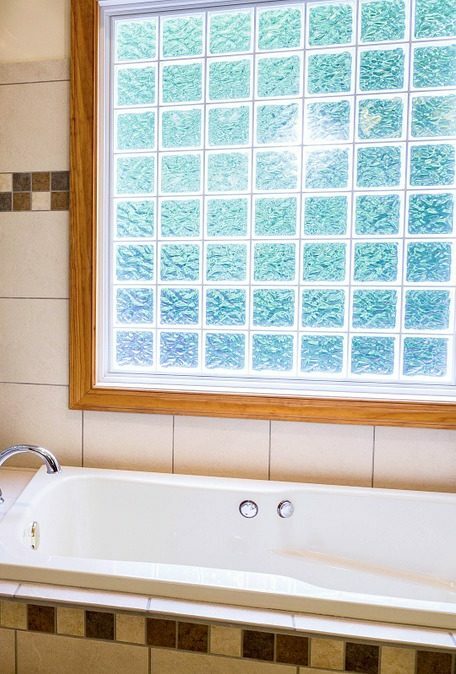 Choose what kind of glass blocks you want to use and purchase enough to fill in your open window area. After that, transfer your measurements to your plastic tracking and use a saw to cut four pieces to fit the window opening. Next, place the first piece of tracking in the window and using your pencil, mark the pilot holes. Use your drill to create the pilot holes, then drive screws through the holes to attach the tracking to the window frame. Repeat steps 3-4 with the other three sides of your window. Once all of your tracking is in place, place your first block in one corner of the tracking. Next, place a plastic spacer vertically on the side of the block and place the next block beside it. Continue to place spacers and glass blocks side-by-side until the bottom row of blocks is complete. Next, place a plastic spacer horizontally on top of your corner block and place a glass block on top. Continue this process until your entire window opening is filled. After that, fill in the spaces between your glass blocks with silicone sealer (starting with the horizontal seams first). When you fill in the vertical seams, skip over the sealer that’s already in the horizontal seams. Smooth the sealer with a plastic putty knife and use a wet rag to wipe away any excess.